A little while ago we did some switching and changing with the rooms in our home. We moved the little ones into a shared room and moved our play room from the front of our house to a room that is a little less visible. This was the best idea ever! Not only do I not have toys spilling into every nook and cranny of our house but I can now just throw everything in there at the end of the day and close the door to the mess if I need to. Right now we have the room decorated and somewhat organized but I have noticed lately that the girls are getting “bored” with their toys and the over all functionality of the room. So, after spending WAY too much time on Pinterest getting inspired I decided on 3 big, but easy changes I would like to make to our play room to get the girls excited about being in this space again. This may be the most important change of all. You moms know, without great storage you have a mess of a play room. And, when you have great storage it is a whole lot easier for the kids to clean up after themselves. This eliminates YOU from having to do most of it. Currently we have some storage but not enough. Right now we have the Kallax Shelving Unit from Ikea and love it but we definitely need a bit more. With our room being small I also have to get creative. When I came across this super fun idea from Ikea Hackers I knew this could definitely be the solution for us. They took a stand and literally just drilled holes in both the bins and the stand and screwed them together. What I love most about this is that toys are stored away but off the floor. 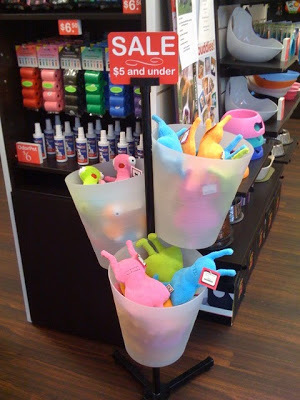 It’s a great place for stuffed animals, big sisters toys, and so much more. I know that this is the play room but even when playing kids are always learning. Right now we are working on letters and numbers and one of the best ways for them to have recognition is to constantly see them. I love this idea from Welcome to the Mouse House. 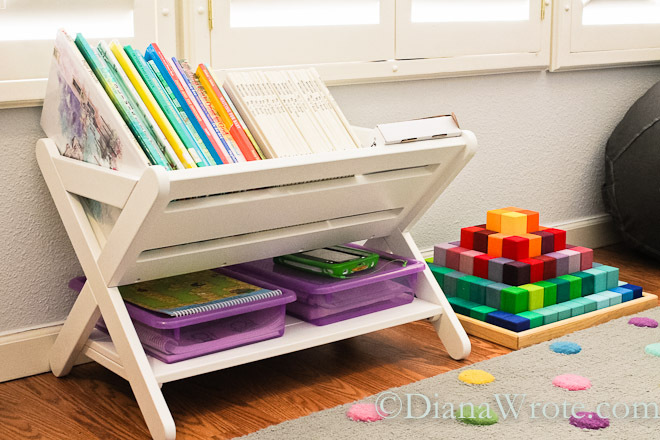 When deciding to add more to our learning station I have also been swooning over the Land of Nod Homeschool Room that is the lovely Diana Stones of Diana Wrote. 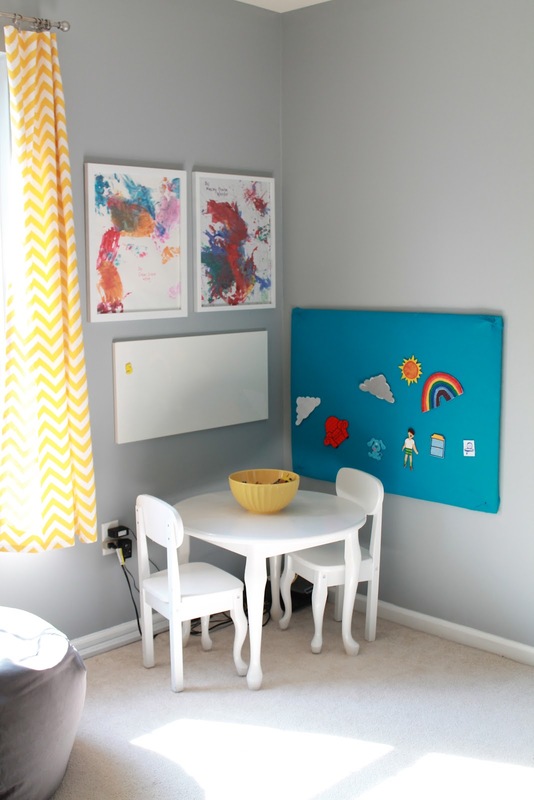 This sweet lady was blessed with a Homeschool room makeover and I am totally jealous of it’s amazingness. Although I cannot afford to replicate it completely there are a few pieces that I may just have to splurge for, like these. the Adjustable Height Everlasting Play Table. Yes, please! My kids LOVE art. They love to cut, color, paint, glue and overall just create their little hearts out. And, like most kids when their art is complete they want it on display. We have their art work everywhere in our home and it not only shows how proud we are of them but it’s cheap and easy decor. Haeley from Design Improvised is all about cheap yet big impact projects for your home. 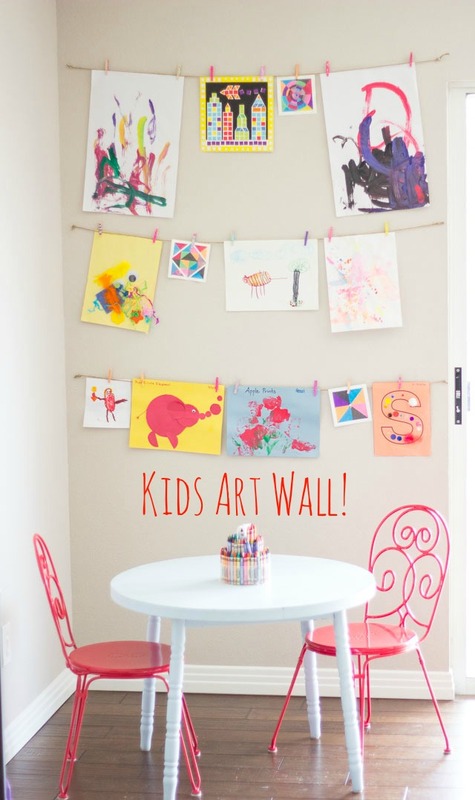 She came up with this great idea for a Kids Art Wall and I love it! Not only is it super cute but I already have all of the supplies on hand including art work that is ready to be hung. I am super excited about these changes we are going to make to our space and cannot wait to share them with you. As my kids grow I know that this space will continue to change with them. I hope this sparks a little imagination for you as to what you can do to get your kiddos inspired to be a little more creative in their learning and playing. Are their any ideas I have missed? Any playroom life hacks I need to try? 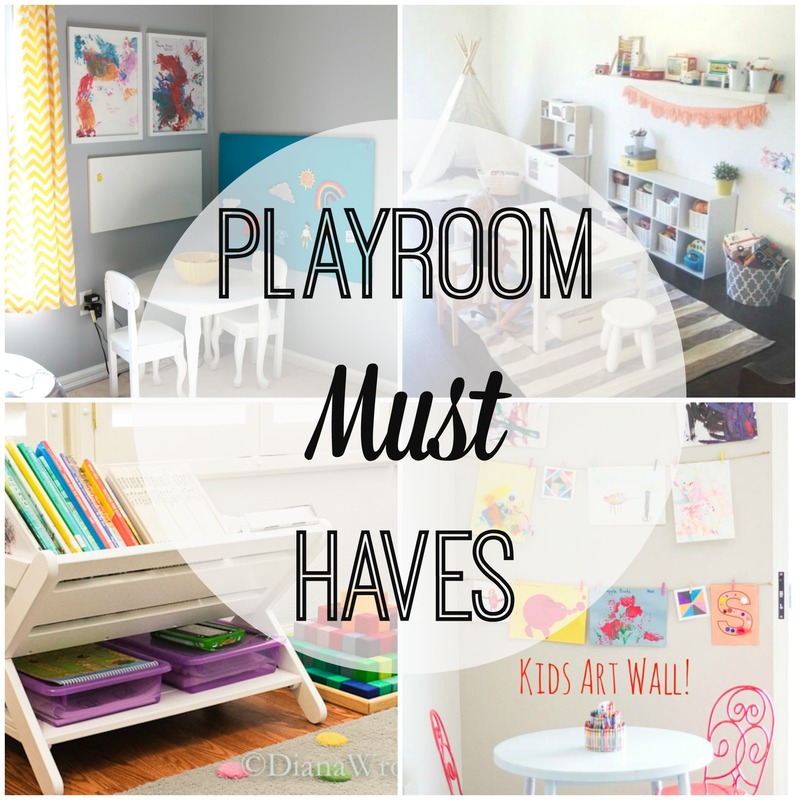 For more play room ideas check out our Pinterest boards that are full of play room inspiration and other fun Mom stuff. Oh la la, I do love all of these ideas! where did you find those red chairs?!?! Where did you find that polka dot rug? Thanks! Hi Julie! I believe that the rug is from The Land of Nod! Great ideas! I am in the process of decorating my girls play-learning room. I am intrigued by the adjustable play table…sweet! Where did you get the yellow chevron curtains if you don’t mind me asking? ?